A common problem after lower blepharoplasty is for the lower lids to pull down or become retracted. Correcting this problem is a specialized form of blepharoplasty surgery called “Revisional Blepharoplasty.” Revisional blepharoplasty involves all procedures needed to redo initial blepharoplasty surgery which did not turn out well or led to ocular complications or poor appearance. This is a highly specialized form of surgery which requires specialized training (Ophthalmic Plastic Surgeon) and years of experience. A retracted lower lid is not only unsightly but also can lead to ocular irritation, pain and in severe cases even loss of vision. It is not a problem which should be taken lightly. Often times it is best not to address the problem (more mild cases) as results can be unpredictable. However, when the condition is more advanced revisional surgery is warranted. For lower lid retraction the procedures needed to correct the problem include a canthoplasty (lid suspension), lid recession (lid lift), a spacer graft (usually placed inside the lid) to support the lid at its higher position, and a midface or cheek lift – again to support the lid at a higher position. The multiple procedures needed to fix a retracted lid all need to flow together smoothly to attain a good result. 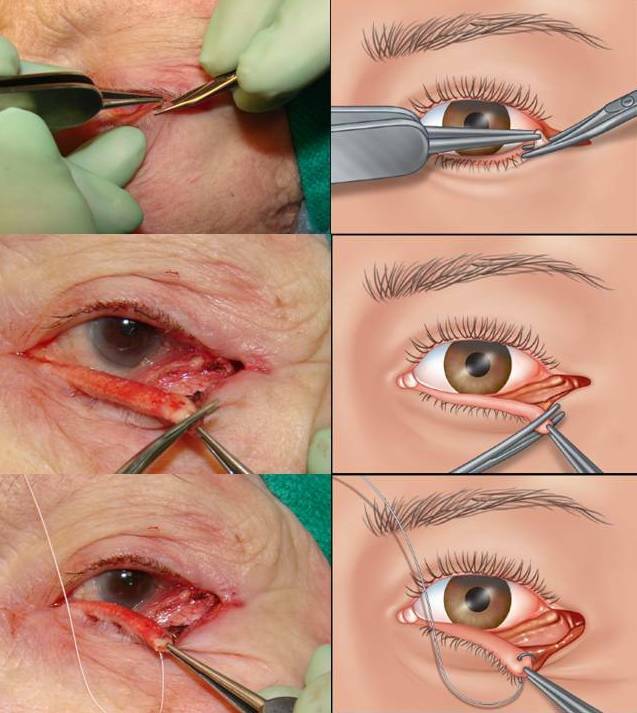 To do this requires a well-trained ophthalmic plastic surgeon who has performed this kind of revisional blepharoplasty (eyelid surgery) before. I cannot overemphasize this point. 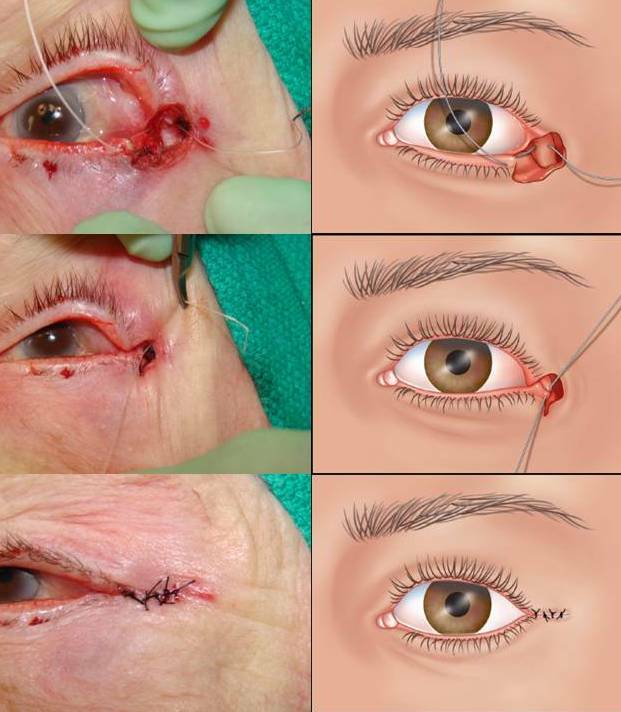 Revisional Blepharoplasty (upper or lower lids) requires an eyelid expert. Below is an example of a woman who had lower blepharoplasty by another surgeon and was left with retracted lower lids (left greater than right). She underwent revisional blepharoplasty by me with a much improved result (lids in much better position). It is important to note that the expectations from revisional surgery need to be tempered with reality. What I mean is that because tissue planes are scared and distorted the situation can be much improved but never made perfect. This must be understood before proceeding with surgery. Last week I wrote about the anatomy of the lateral canthus (the point or angle where the lower lids meet laterally). Today let me discuss the importance of tightening the lower lid (canthoplasty or canthopexy) during blepharoplasty (ie. why we do it). Above is an example of a lower lid ectropion (left) after surgery from another physician. After corrected the problem (right) there is a significant improvement. These complications occurred because surgery was performed without providing support for the lower lid. Without this support - gravity, wound healing, and natural muscle weakness after surgery led to these problems. Anderson RL, Gordy DD: The tarsal strip procedure. Arch Ophththalmol. 1979;97:2192. In my next blog on canthoplasty I will describe the procedure in depth and provide illustrations of the technique. The take home message from today is that appropriate lower lid blepharoplasty requires a detailed knowledge of canthal anatomy (see last blog at http://drmassry.com/blog/?p=190), and significant experience with canthal surgery. If these two critical things are not present complications will occur – they always do. Fixing a canthal complication is exponentially more difficult that doing it right the first time. A canthoplasty is a surgical procedure whereby the terminal portion of the lower lid is secured to the bone of the outer orbit. 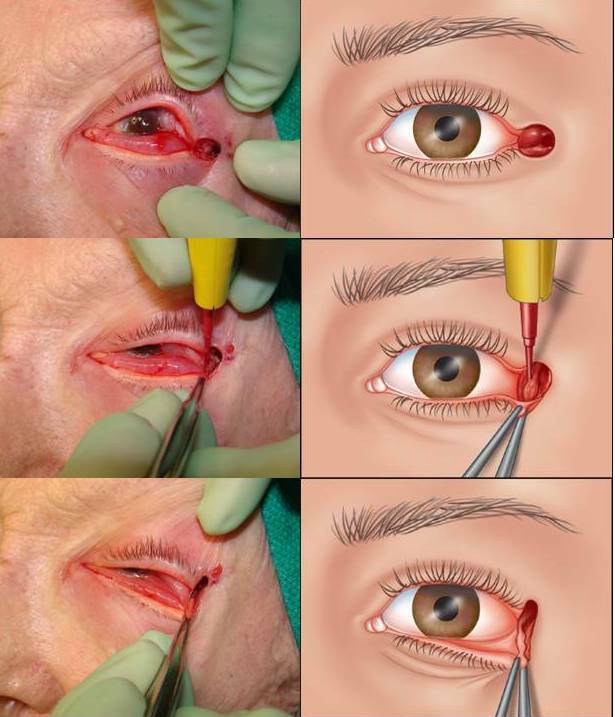 In essence THE LID IS TIGHTENED.In reconstructive surgery the tarsus (the cartilage skeleton of the eyelids) is typically trimmed and sutured to the periosteum (tissue lining the bone). In cosmetic surgery less disruptive techniques have been developed so that distortion of the canthal angle (angle where the eyelids meet) is not distorted. A canthoplasty, or its more simplistic cousin (the canthopexy) is often performed in cosmetic lower lid surgery (blepharoplasty) to help maintain the normal position and shape of the lower lid. 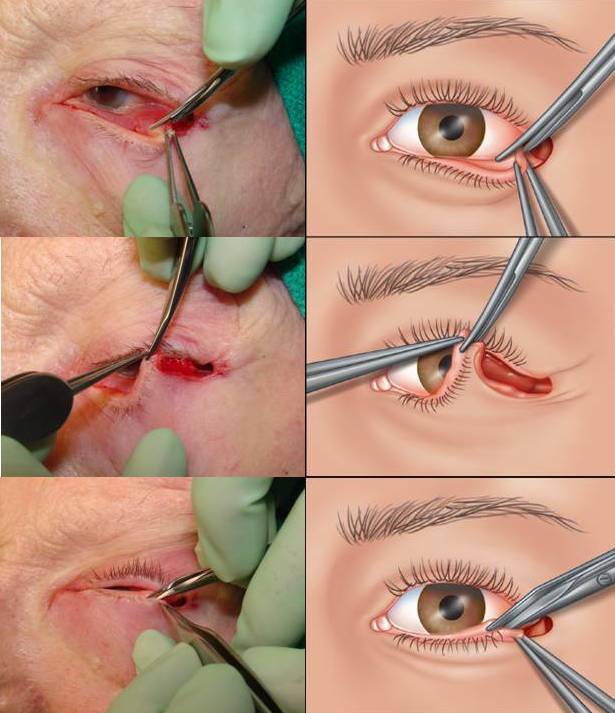 Poor canthoplasty surgery is one of the most difficult eyelid problems to correct. This is a topic of a different discussion which I will review in a later blog. Before getting into the canthoplasty procedure itself it is important to understand canthal terminology and anatomy. 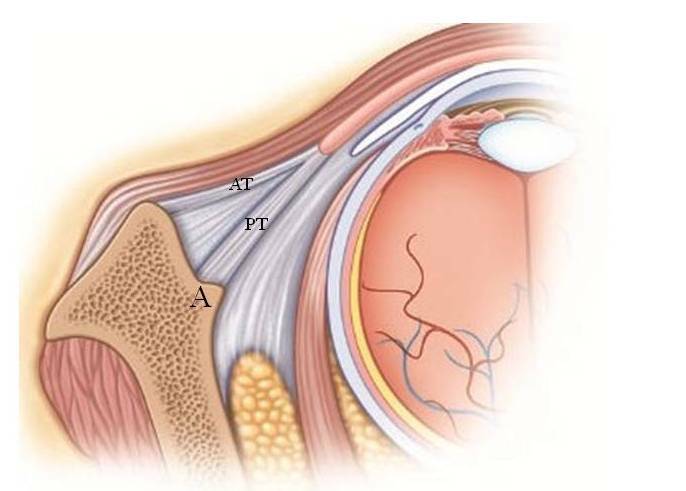 The lateral canthal tendon or lateral palpebral ligament (interchangeable terms) is the band of tissue which connects the lids to bone. This is one of the structures which is tightened and/or shortened when a canthal suspension is performed. When the canthus is manipulated surgically the canthal angle and lateral commissure may or may not be incised, but the tendon is always cut, shortened or tightened. VERY IMPOTANT POINT. When performing canthoplasty correctly it is critical to recreate the normal lid attachments to bone (as described above). If this is not performed correctly problems in lid shape and position can occur. Make sure an eyelid specialist performs this procedure to avoid such problems. Every day I see patients who want refreshed, less tired looking and more youthful eyes. They all ask about how to do this surgically. Clearly surgery is the mainstay to improving sagging and puffy eyelids. However, non surgical treatments such as Botox and fillers (Restylane, Juvederm, etc.) can be a powerful alternative, especially in patients under the age of 45-50. We tend to think of Botox as a wrinkle treatment because that is the way it is marketed. In reality it is a muscle weakening agent (which in turns secondarily reduced wrinkles). The forehead, eyebrows and eyelids are in a dynamic state of equilibrium consisting of muscles that elevate or depress these structures. By “weakening” an elevating or depressing muscle (depending on needs) I can change the position of the brow, the fullness, heaviness and puffiness of an eyelid, and improve the contour of the lids. This is a very important concept. Let me repeat. I can significantly improve eyebrow/eyelid position and appearance without surgery (with Botox). This is an extremely important piece of information for those not yet ready for surgery. Fillers are equally as important as Botox in non-surgical eyebrow/eyelid rejuvenation. Restylane and Juvederm, can be injected around the eyes to add volume and support to the eyebrows and eyelids. This supports acts (like Botox) to help lift and contour these structures. While fillers work in a different way than Botox the two products acts together very well to improve the aesthetics of the eyelids. The choice of what type of anesthesia to use for surgery is a critical component of the surgical experience and should be thoroughly reviewed by the patient and surgeon. The goal is to make the procedure as comfortable as possible while doing it in a way to assure the best possible outcome. This decision is easy when surgery can performed without the need for any patient cooperation. This is true of most plastic surgical procedures (but not all eyelid procedures). In this instance the surgery can be performed under general anesthesia. This is the deepest level of sedation that is used and requires assistance with supplying oxygen (which we need for nourishment) to our body and with ventilation (getting oxygen into the lungs). Under general anesthesia, oxygenation and ventilation are assured with a device placed into the back of out throat or pharynx (a laryngeal masked airway or LMA) or into the windpipe or trachea (an endotracheal tube or ET tube). When surgery is performed this way patients typically know nothing, feel nothing and often awake with no recollection of the procedure. This is why patients typically prefer general anesthesia. The downside to general anesthesia is the recovery. It is often associated with a slow awakening, feeling groggy and sluggish for hours, and sometimes nausea, chills and a sore throat. Most of these symptoms resolve within a few hours. However, some, such as nausea, can last for a day or so. As a result of these side effects, other, less sedating (fewer drugs given) forms of anesthesia can also be used. These methods include conscious sedation and local anesthesia. I will review each technique in blogs over the next two days. Cosmetic eyelid surgery is about looking better and natural. This can only occur with an appropriate preoperative evaluation which identifies all aspects of the eyelids and adjacent structures which must be addressed during surgery. This approach will prevent patients from being unhappy after surgery. Patients don't always know what about their eyelids make them look tired, worn or older. They just know they want an improvement. It is incumbent upon the cosmetic surgeon to inform and educate the patient regarding these issues so that the best outcome can be attained and realistic expectations are set in place. What is the best way to do this? Well that is simple - Select the best surgeon for the job. This means a surgeon with the appropriate specialized training in surgery of the eyelids. Below is an example of a patient before (left) and after (right) eyelid surgery which included an outer brow lift, ptosis repair, lower blepharoplasty with fat repositioning, canthopexy and slight lower lid skin excision. This example clearly demonstrates how many different procedures are needed to attain the best result possible. This could not have been attained without a surgeon with specific eyelid expertise. Facial fillers are injectable materials, used to plump up areas of the face (add volume), such as the lips, or treat facial wrinkles. They are different than Botox in that they do not reduce wrinkles by weakening the movement of facial muscles. They do so by filling in lines or depressions (like the dark circles under the lower lids). Sometimes they are used together with Botox as the combination may work better than each individual treatment. Historically Collagen was used to fill lines for years. Today other products are used more commonly. The most common fillers used in Dr. Massry’s practice are made from Hyaluronic acid and include Restylane, Juvederm and Perlane. Hyaluronic acid is a normal part of the human body which is lost (decreases) with age leading to facial aging (wrinkles and a gaunter look). Dr. Massry feels filling the face with Restylane, Juvederm or Perlane can certainly restore a more youthful look. These gels are injected under the skin after application of a topical or injected anesthetic. The fill created from Restylane, Juvederm and Perlane is seen immediately and the patient and Dr. Massry can then decide together how much is appropriate. If an under-correction is attained (still have wrinkles or hollows), more filler can be given. A vial of Restylane, Juvederm or Perlane is typically good for 6 months and can be stored in Dr. Massry’s office. If an overcorrection occurs (too much) with creation of an irregularity (lump/bump), a correction can be performed with the injection of a revering agent (Vitrase or Hyaluronidase). The most common areas Dr. Massry treats with these fillers are the hollows under the eyes (tear trough), the lines between the lips and cheeks (nasolabial folds), the cheeks, the jowl areas (lower face) and the temples. There are variable degrees of bruising and swelling that can occur after treatment (usually for a few days) depending on the area treated. There is more swelling in areas of thinnest skin and where there are a greater number of visible blood vessels. These are Dr. Massry’s preference on the various facial and eyelid fillers he uses. Restylane to restore facial fullness and treat facial wrinkles. Restylane is his first choice for under eye hollows (tear trough) which can cause dark circles under the eye. A treatment with Restylane should last 6 months. Repeat treatments are needed to maintain the effect. Perlane, like Restylane, to replace the lost volume in the face and to add fullness and reduce wrinkles. The main difference between Restylane and Perlane is the size of the gel particle with Perlane’s being larger. For this reason Dr. Massry uses Perlane to treat deeper lines or larger depressions such as in the cheeks and lower face. Juvederm may have a smoother texture than Restylane and Perlane, and he finds that is has greater utility in very fines lines of the face. Side effects with all three fillers are uncommon and primarily are related to bruising and swelling. No allergy test is needed with any of the hyaluronic acid gels as they are a normal part of the human body. As was previously mentioned, a great benefit of Restylane, Perlane and Juvederm, is that they can be reversed with an injection so that if a patient does not like the fill it is made temporary. Cosmetic wrinkle treatment, especially around the eyes, is a practice which requires a specialist to get the best results. Asian upper lid blepharoplasty is a specialized form of surgery, common to all Asian people (Chinese, Japanese, Korean, Filipino, etc), whose aim is to improve the aesthetics of the upper eyelids without changing the ethnic appearance of the patient. The anatomy of the Asian upper eyelid is distinctly different than that of the Caucasian eyelid. A thorough familiarity with Asian lid anatomy is crucial to attaining successful surgical outcomes. An aesthetic Asian upper eyelid should have natural fullness and usually a distinct crease. These are typical patient desires and goals of surgery. The procedure should be tailored at attaining these results. This requires a detailed knowledge of Asian eyelid anatomy and of the surgical procedure itself. If the goal of surgery is only to produce a crease (double eyelid) as is often desired by younger patients, the crease can be formed from the inside of the eyelid, without an external incision (no scar), by suture placement only. 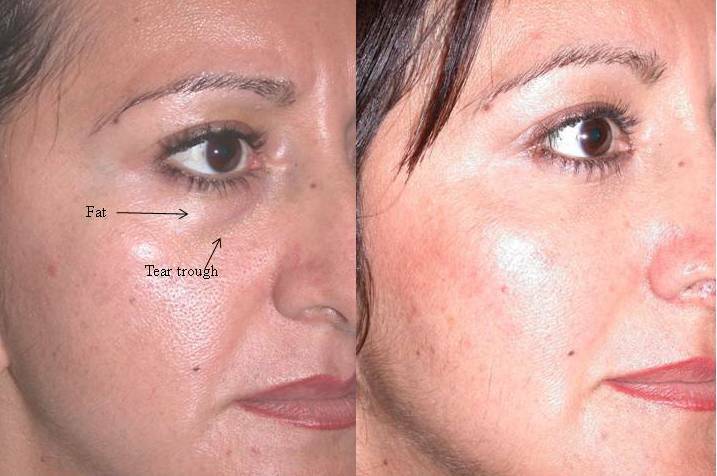 While this technique avoids the potential for an eyelid scar, it does not have the lasting effects of standard surgery through the skin of the eyelid. If, on the other hand, there is a need for removal of excess upper eyelid skin, the surgery must be performed through the skin. While Asian eyelids may have a greater tendency to scar that Caucasian eyelids, this is typically not a problem. Abnormal scar formation is usually related to thickness of the skin and tension of the closure of the wound, issues not usually relevant to normal first time eyelid surgery. However, in the rare instance that a significant eyelid scar does develop, there are treatments available (for example: injectable and topical medications). If you, or a friend, is considering upper lid blepharoplasty, and are of Asian ancestry, please make sure that the doctor you select is an EYELID SPECIALIST, and has experience with this procedure. If surgery is not to your liking, it may be difficult to revise.